The Style Organizer ISTJ approach to life is reassuring and exacting, based on an organized and methodical approach to life. At their best when in control of their tasks, Style Organizer ISTJs prefer not to leave too many things to chance (and certainly not important-to-them things). Style strengths are thought-provoking. Style Organizer ISTJs have a consistency to most things they are involved in, it’s one of their hallmarks, as it is for other SJs, and STJs in particular. And style is no different – a key style strength is to create a dependable look, avoiding anything erratic or overly attention seeking. This consistency in look mirrors the consistency they have with the quality of their work, the precision of their approach/planning, and the sincerity of their actions. Part of the Style Organizer ISTJ style DNA is the driving need to be appropriate. In our research, this came out as absolutely critical for the ISTJ. Our ISTJ interviewee said she “would die” if she arrived somewhere important inappropriately dressed… now we know she didn’t mean that literally, which is unusual for ISTJs who usually speak in literal terms, but it certainly hammered home how compelling a need appropriateness is for Style Organizer ISTJs. Style Organizer ISTJs do details beautifully. The Sensing part of their style type code assures us that they master the practical specifics. In a style sense, we notice this with grooming – which is often subtle but immaculate, in closets which are neat and organized according to a visible system and a getting-ready-for-the-day process that is streamlined and efficient. It’s beautiful simplicity. With a methodical, structured and organized approach to life, this translates easily into the style space for Style Organizer ISTJs. 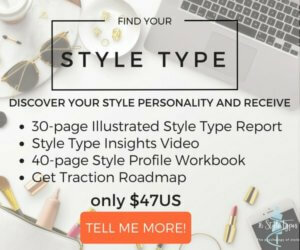 Style rules often the very foundation on which the Style Organizer ISTJ builds her style, and they are viewed as something to keep her style safe. Style rules exist for a reason, and so long as there’s a solid logical underpinning to them, the stylish ISTJ will be happy to follow them, knowing her style is being safely and beautifully expressed.